The solution of this puzzle is impeded by the absolute lack of data, but the story is beautiful. In Mallorca, the lower border of the roof of the farmhouses was often covered by painted tiles. The custom dates from the Middle Ages, but nothing more is known about the exact date or place of its origin. It seems to have spread from the manor houses in the mountains to the rest of the island. In the valley of Sóller still there are many examples of it, but we also find them in Muro, Binissalem, Esporles or Sancelles. It is always decorated in a very simple, popular style, and with apotropaic or prophylactic motifs so that it might protect the roof of the house and the people living under it. Of course, they can be also found in places very far away from Mallorca, as it is attested by these precious examples of Chuquinga, Peru. 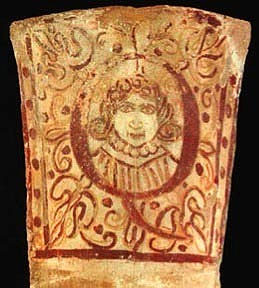 Guillem Rosselló Bordoy has just published a curious book: Les teules del claustre, in which he presents a set of 17th-century painted tiles – which were, in contrast to the above mentioned examples, decorated by the hand of a trained painter – recently found in the Convent de Sant Bonaventura of Llucmajor. They are 134 in number, that is only a small part of those that had flanked the roof on the four sides of the cloisters of this Franciscan monastery. The tiles were provided by a letter each one, so that in they original order they used to form a text, whose reconstruction is the puzzle I referred to in the first phrase. The book – from which we borrowed our illustrations – has also more information and hypothesis, but they do not seem to be especially helpful to the verification of the phrase. Let us see whether some of our Readers who is especially knowledgeable about Franciscan ways and customs will be equal to the task.